Many event spaces come with their own list of preferred or required vendors. When you sign your lease you may find the requirement that only these vendors are used in that event space. The downside is these vendors may be more expensive than those you find on your own. You may not be able to shop for the best deal on caterers, equipment rentals, and so forth. So, if you plan to use an event space, be very careful to understand their requirements to use preferred vendors. If you are planning a romantic wedding reception, a theme party, or any other event, you may find the event space decor doesn’t match your vision or worst case conflicts with it. Therefore, you will have to spend more money and time covering up the decor with your decorations. Then you have to be sure to remove your decorations immediately after your event or you will be charged a fee. Event spaces come with very specific rules about when you can enter to set up and when you have to vacate the space. This may not be enough time to set up your event the way you would wish. Therefore you may need to pay for extra time, which adds to your cost. For any or all the reasons above, event spaces can rapidly raise your cost well above your budget. 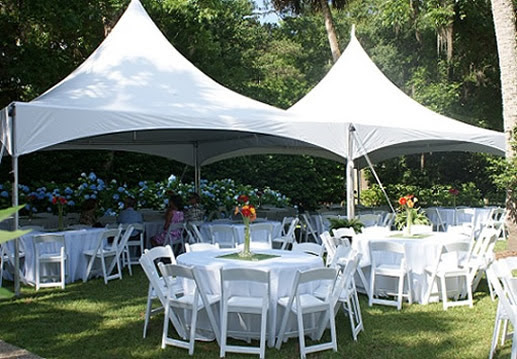 Why not rent a tent and other party needs from Pink Elephant? We set everything up for you, and you can decide how long you want your event to last without the hassles of being charged for this and that. We can rent you catering equipment, lighting, chairs and tables, even a bounce house for the kids. We can provide fun food equipment for cotton candy, popcorn, or a chocolate fountain. Offer your guests hot dogs or warm pretzels. For a more elegant affair, we can provide a professional wait staff, bartenders, and a grill cook. We even have a private bridal assistant to make your wedding perfect. Whatever event you are planning, don’t be locked into a restrictive event space rental. Contact Pink Elephant Party and Tent Rentals today and let us give you the perfect party space!